Cambodia announced two major bilateral trade agreements recently, with the Philippines and Thailand, that are expected to further expand the country’s rice export sector. Over the last few years, Cambodia has emerged as a major rice exporter in the region, due in large part to the Royal Government of Cambodia’s (RGC) recent expansion of its agricultural sector. If Cambodia’s rice export sector were to reach its full potential, it could produce 3 million tons of milled rice, with the total export value amounting to $2.1 billion (approximately 20% of the GDP) and an estimated additional $600 million (approximately 5% of the GDP) to the national economy. It would also boost employment and income for agricultural farmers who make up more than 70 percent of the population living in rural areas. 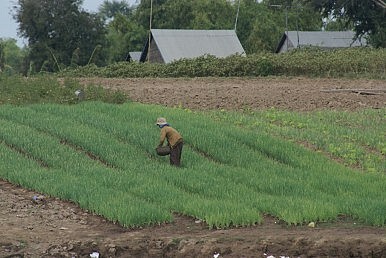 Despite positive development, compared to neighboring countries with similar weather and soil conditions, Cambodia’s paddy rice yield remains relatively low. In 2006, the average yield was 2.6 tons per hectare, while Thailand, Laos, and Vietnam achieved 2.8 tons, 3.5 tons, and 4.9 tons, respectively. The underutilization and non-usage of arable land is a huge deterrent to the industry’s growth. Most Cambodian farmers cultivate paddy rice once per year during the rainy season, while farmers in Vietnam’s delta region cultivate 3.5 times annually. Such low productivity is mainly a result of high energy prices and poor transportation infrastructure. For example, in the low elevation Mekong plain, petroleum products are generally used to pump water into irrigation canals, which makes it too expensive for farmers to plant multiple crops a year. Moreover, rural areas pay a much higher rate (30-90 cents per kWh) than those living in urban centers (20 cents). In contrast, farmers in Vietnam only pay about 10 cents per kWh. Poor transport and infrastructure such as roads, railways, warehouses, and handling equipment also increase costs for farmers. To transport one ton of rice on a 100 km road, Cambodian farmers must spend US$15, while their counterparts in Thailand and Vietnam pay US$4 and US$7.50, respectively. The lack of handling equipment in one of the main ports, the Sihanouk-Ville Port, is also a major constraint for the export of large quantities of milled rice. In addition, lack of access to and high cost of credit decreases domestic economic value-added and hinders milled rice export, presenting an obstacle for rice millers to stockpile paddy rice. According to the Rice Policy, If Cambodia is to export 3 to 4 million tons of milled rice per year, it has to produce at least 10 to 11 million tons of paddy rice. In fact, in 2012, Cambodia enjoyed a surplus of more than 4.7 million in paddies, according to the Ministry of Agriculture Forestry and Fishery. Yet, official figures from the Ministry of Commerce showed that it only exported 200,000 tons of milled rice last year, or only 10 percent of its full capacity. To better understand the bottlenecks in the rice sector, The Asia Foundation, in partnership with the AusAID-funded program, “Cambodia Agricultural Value Chain” (CAVAC), hosted a series of consultative forums last year in three provinces – Kampong Thom, Kampot, and Takeo – with stakeholders from the private sector (farmers, seed producers, agro-business owners, exporters) and the public sector (Ministries of Agriculture, Commerce, and Water Resources Management, provincial governors, provincial departments of line ministries, and local authorities). Approximately 370 participants attended the workshops and discussed how to create business-friendly environments (i.e., competitiveness and productivity, access to finance, access to markets), and the technical aspects of rice production (use of fertilizers and insecticides, seed categories, and availability of water sources). The insights were frank and eye-opening. Implementing a strategic framework like the Rice Policy is just the beginning. To increase paddy rice production to meet market demand and promote the export of milled rice, the government must initiate and support a host of reforms in partnership with the private sector. For instance, to solve the issue of credit shortages for buying and processing paddy rice, the government can provide incentives to commercial banks to increase the loan portfolio for agriculture. At the end of the day, the RGC must keep the farmers themselves in mind. Introducing new technologies or improving agricultural practices can only go so far if they are not accepted and adopted by farmers. Donors and NGOs can play a pivotal role in providing support and facilitating the successful implementation of new policies and projects aimed at improving the agricultural value chain. As a relatively new player in the milled rice market, Cambodia faces a steep learning curve. However, with a surplus of 3.5 million tons of paddy rice (equivalent to 2 million tons of milled rice), Cambodia has the potential to soon be among the top five milled rice exporters in the world. More importantly, growth in the agricultural sector will translate into more economic opportunities for Cambodia’s vast rural population. While not a silver bullet, the success of the rice sector is an exciting and potentially crucial driver in Cambodia’s prosperous and equitable development. Khut Inserey is The Asia Foundation’s senior program officer in Cambodia. This article was originally posted on The Asia Foundation's Blog, In Asia. The views and opinions expressed here are those of the individual author and not those of The Asia Foundation.